A gritty tale of how far we'll go to protect the ones we love for fans of Daniel Woodrell's Winter's Bone from Gale Massey, a talented new name in crime fiction. Everyone says the Elders family are nothing but cheats, thieves, and convicts--a fact nineteen-year old Jamie Elders has been trying desperately to escape. She may have the natural talent of a poker savant, but her dreams of going pro and getting the hell out of the tiny town of Blind River, New York are going nowhere fast. Especially once she lands in a huge pile of debt to her uncle Loyal. At Loyal's beck and call until her debt is repaid, Jamie can't easily walk away--not with her younger brother Toby left at his mercy. So when Loyal demands Jamie's help cleaning up a mess late one night, she has no choice but to agree. But disposing of a dead man and covering up his connection to the town's most powerful judge goes beyond family duty. When it comes out that the victim was a beloved athlete and Loyal pins the murder on Toby, only Jamie can save him. But with a dogged detective on her trail and her own future at stake, she'll have to decide: embrace her inner criminal, or defy it--and face the consequences. Gale Massey was born on the west coast of Florida. A master's level graduate of Georgia State University, she has received scholarships and fellowships at The Sewanee Writers' Conference and Writers in Paradise. Her flash fiction story The Train Runner was nominated for a Pushcart. She lives in St. Petersburg, FL with her family. 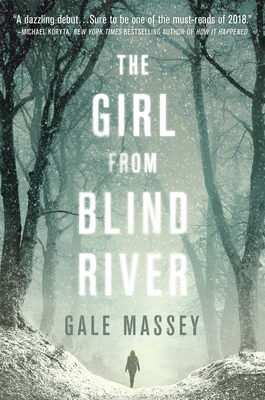 The Girl From Blind River is her debut novel.